This book has been on the NYT Bestseller list since it’s been published. One of my coworkers at Barnes & Noble read it and loved it. She raved about it so much, I decided to give it a try. This book definitely makes you think about the clutter in your life in a different way. As a person who loved clean, clutter free anything, this book spoke to me in that manner. One of the best things about the KoMari Method is that it really makes you think about why you keep the things you keep. I was a little indifferent about the litmus test she used of what you should keep and what you should toss, but that was kinda minor. I don’t know if I was ready to get into my feelings about my clutter. 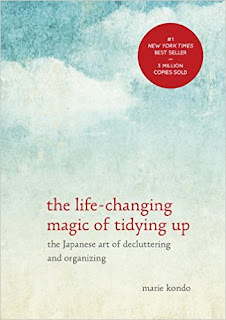 This book definitely made me what to clean, but felt a little anti-climatic since Kondo has a method in which you are to clean. I would recommend you not read this book until you are ready to start the purging process. I will put many of the things she suggests into practice. I may have to read her new book, too. My upcoming reviews will be posted in the sidebar. Comment below if you want to read along!